A lot of people think that they need to cough up the cash for smart LED bulbs to get nifty features that aren’t actually “smart.” For example, you’re crazy if you spend $50 a bulb for Philips Hue lights if all you want is a bulb that will automatically turn on at night and then back off again in the morning. 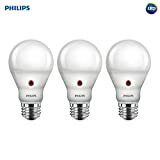 The Philips LED Dusk-to-Dawn A19 Frosted Light Bulb does exactly that, and 3-packs are on sale right now on Amazon for just $23. That’s under $8 a bulb instead of $50! ENERGY EFFICIENT: Philips LED Dusk to Dawn A19 Light Bulbs use roughly 75% less energy than 60 Watt Incandescent Bulbs while maintaining the look and feel of a classic light bulb. Philips LED light bulbs are Mercury free and Energy Star Certified. LONG LASTING: These Philips LED bulbs last 10x longer than incandescent and 4x longer than halogen bulbs. Each light bulb is expected to deliver a lifetime of up to 22,000 hours and includes a 10-year warranty, saving you the cost of frequent bulb replacement. SOFT WHITE: Philips LED Dusk-to-Dawn A19 light bulbs offer warm and comfortable lighting with high CRI (color rendering index). At 2700-Kelvin these bulbs deliver bright, crisp color ideal indoor and outdoor use. DUSK TO DAWN: Philips LED Dusk-to-Dawn A19 Light Bulbs are equipped with a built in light sensor that turns your light bulbs on automatically when the sun goes down and turns the light off when the sun rises. COMPATIBILITY: These Philips LED light bulbs fit in E26 medium screw bases. Not compatible with Philips HUE products. Philips LED Dusk-to-Dawn A19 light bulbs are for non connected use only. COMFORTABLE LIGHT: Our products meet strict test criteria including flicker, strobe, glare and color rendition to ensure they meet EyeComfort requirements. Switch to Philips LED, light that’s designed for the comfort of your eyes.